Patient / Caregiver solutions that improve overall patient health. We offer patient / caregiver applications that can improve internal & external communications & track patient flow. Connect to your patients quicker and more convenient than ever before. Track, manage patient flows throughout your healthcare facility. Secure sending of messages in multiple formats with full HIPAA compliance. Help is never far; we support all our solutions to ensure that they continually provide the best performance. 2-way communication enables a patient or member response to your prompts through direct dialogue. Reduce costs with quick response texts to patient and caregiver; freeing up staff from time on the phone, saving $2 – 4 per call. Improve outcomes throughout patient cycle by increasing touch points, efficiently delivers preventative and ongoing care information. Enhanced patient care through suitable communication channels with relevant reminders, information, and prompts for patients. Increase revenue by reducing “no shows”, “no go’s”, and cancellations to drive greater compliance and protocols. Proven ROI of an average 3-5 times. 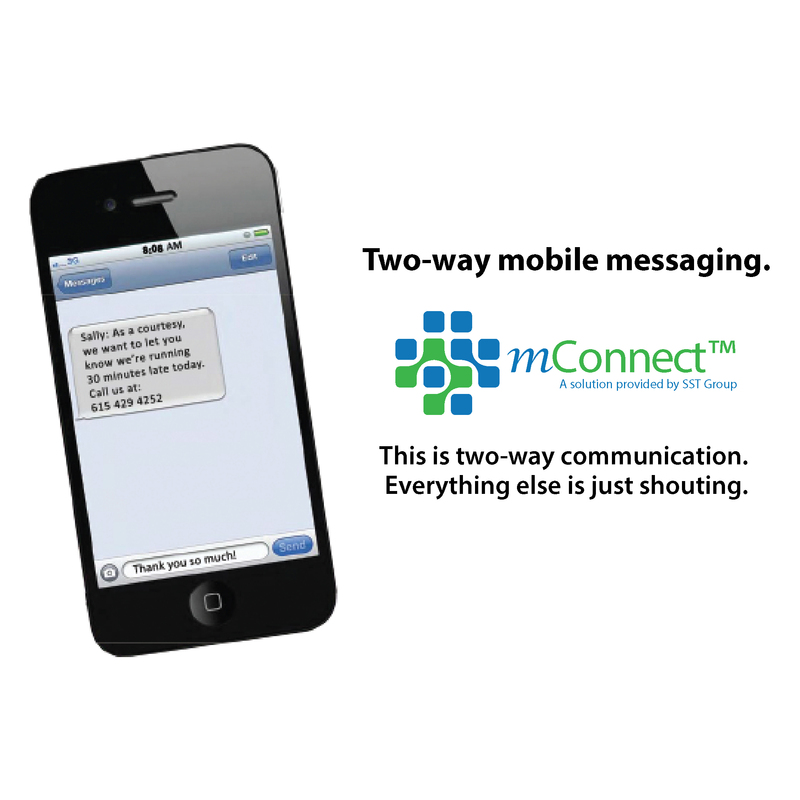 Simple connection allows you to reach your patients whenever and wherever with text message communication. Increase flow with patient tracking to find problem areas and improve patient care. Customization of full dashboard capabilities to help user and staff needs and preferences. Scaleable solution for facilities big and small. Easy compliance with all systems and packages becoming HIPAA compliance. Complete repoting with robust packages to analyze the entire patient process. Manage workflow of patients easier than ever before, decreasing wait times, enhancing patient visits. Multi-channel security with secure SMS/text messaging, 2-way multi-channel paging, interactive text messaging, voice calls, and email. Remote control allows administrators to control device wiping, inactivity time-outs, lifespan control, and geo-fencing from anywhere. Encryption keys create two-factor personal authentication and encryption for delivery with unique dynamic keys. Send anytime via secondary control channels for redundancy and fail-over data receivable in “dead spots” delivery. Install on any smart mobile device adding CellTrust for instant HIPAA compliance. Eliminate unneeded actions for doctors to access networks, use answering services and call-backs. Remove obstacles for security, burdens of multiple pagers and obsolete legacy technology.
" We just purchased and installed our new CD burner from SST Group. We choose the DMC-EZ 550 for its printing speed. The installation, configuration was seamless and training our users was very straight forward due to the intuitive interface. We even came back with several changes to customize our labels and splash pages for the CD produced, and the support staff made these changes quickly to please our marketing department." "We have been a customer of SST Group for over 5 years and the level of support they provide is above and beyond what the competitors in the same space have provided our facility. I would recommend SST Group and it products to any facility that is interested in the best in class product and support"
I have actually had a great experience with not only Jayson but with Suzy, too. I have nothing but good things to say about SST Group. My facilities’ needs were addressed immediately and our device was replaced within 48 hours of learning that it has a non-functioning drive. We, with Grand Strand Health, focus primarily on patient care and it is apparent that you focus on customer care thus enabling us to provide uninterrupted service. I can’t say enough about SST. It has been a true pleasure to work with SST for the past few years. They are always quick to respond to service tickets, usually within minutes of placing the emailed request. Also, great phone support with excellent communication between the customer and support. If we have any type of hardware that is not repairable, new equipment is supplied overnight and field support dispatched the same day. We have had great success using the CD burning software, QA module, and the DMC-EZ burning systems. I look forward to a long relationship with SST. We recently purchased two DMC-EZ models from SST Group. The installation and training that Ryan provided was very helpful and professional, he is a great asset to your team. We are looking forward to our working relationship going forward. "The DMC-EZ software is one of the easiest to use and most powerful that we have found on the market today. The Virtual Media creator has reduced our expenses on overnight or courier costs since delivery of the urgent study requests happen in minutes, safely and securely. Also wanted to note that the support services provided by SST group have been outstanding."